The Kona small SUV is expected to boost Hyundai sales and profits in Europe. Hyundai will double the number of SUVs it offers in Europe to four by 2019 and is expected to boost its crossover lineup even further by 2021, which is when it aims to pass Toyota and Nissan to become the region’s top-selling Asian brand. Hyundai's SUV-driven product offensive started this summer with the debut of the Kona subcompact SUV, which goes on sale in Europe later this year. It will be followed by a minicar-sized crossover, which Hyundai sources say will arrive in Europe in 2019, and a flagship crossover that will be larger than the midsize Santa Fe/Grand Santa Fe SUV is expected to follow later. Currently, SUVs account for about 35 percent of Hyundai's total sales in Europe. The automaker expects that number to rise, but would not provide a target. Sister brand Kia, which is growing three times faster than Hyundai in Europe, gets about 41 percent of its sales in the region from SUVs. At Nissan, SUVs account for more than 70 percent of the brand's European sales. Toyota counts on SUVs for nearly 30 percent of its sales but that’s up from 12 percent last year because of the arrival of its all-new CH-R compact crossover. The demand for SUVs shows no signs of slowing as the market share for the models in Europe through May was 28.2 percent, up from 24.7 percent during the same period last year. "The widening of the SUV range is a must today if you want to keep or increase your market share in Europe" said JATO analyst Felipe Munoz. "Hyundai is growing slower than the European market in 2017 because it sells only two SUVs." The Kona is expected to help boost Hyundai's European sales -- and its profits. "We forecast Kona sales in Europe will be 63,600 in 2018, its first full year on the market, and peak at 64,000 the following year," said IHS Markit analyst Ian Fletcher. While he doesn't expect the Kona to be the segment leader, it should easily outsell the model it replaces, the ix20 minivan, which accounted for 33,000 units last year. 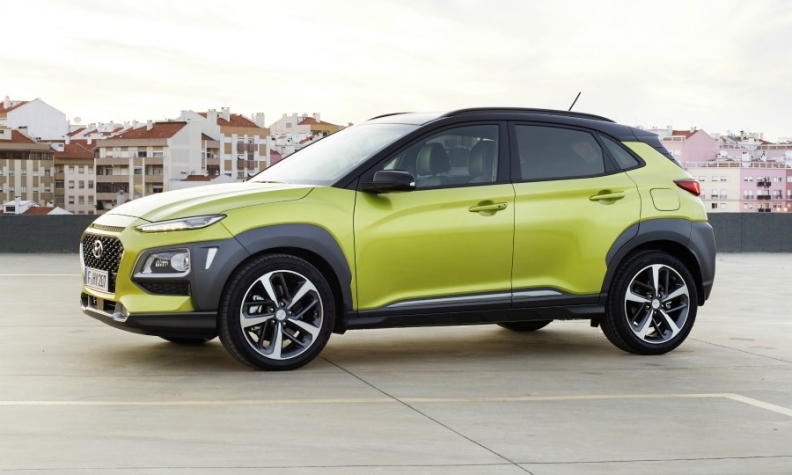 "The Kona will also be more profitable [than the ix20], given the higher average prices of SUVs, and will bring to Hyundai new types of customers," Fletcher said. Hyundai Europe Chief Operating Officer Thomas Schmid agrees. He also recently called the Kona "an important milestone of our journey to become the No. 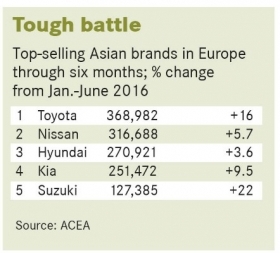 1 Asian automotive brand in Europe by 2021." The Kona will challenge subcompact SUVs such as the Renault Captur, Opel/Vauxhall Mokka as well as Volkswagen's first model in the segment, the production version of the T-Roc that will debut at the end of this month. Another rival is the Stonic from sister brand Kia. The Stonic shares its platform with the Kia Rio platform. The Kona's platform is all new and it will be used for several sibling subcompacts, including sedans. A full-electric version of the Kona will be added to Hyundai's European portfolio in the second half of next year. The mini-SUV, which will share its platform with the i10 minicar, is arguably the boldest and riskiest model in the growing portfolio because until now very few automakers have been willing to offer a crossover in a European segment where margins historically have been tiny. Currently, the only models that could be considered mini-SUVs are the Fiat Panda Cross and Suzuki Ignis as both offer four-wheel drive. Hyundai would not say whether its offering in the segment would do the same. Hyundai said small SUVs are the world's top-performing segment, with an annual average growth rate of 46 percent from 2010 to 2016. "Even as the global SUV market is nearing saturation, we believe that extra small or small SUVs have more room for growth than large SUVs," Hyundai Vice Chairman, Eui-sun Chung said at the Kona's debut in Seoul in June. Chung also said Hyundai will launch a top-of-the-range SUV, which will be larger than the midsize Santa Fe. The new model’s likely rivals in Europe would include seven-seat models such as the Nissan X-Trail and Renault Koleos. According to JATO's Munoz, Hyundai’s large SUV is likely to be aimed at the U.S. to compete again models such as the VW Atlas. In Europe, large SUV account for 1.7 percent of the market while in the U.S. they account for 12.2 percent of total sales.